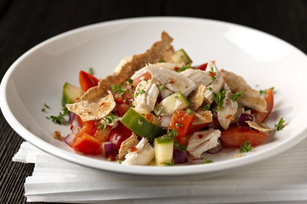 Here's a better-for-you take on the classic panzanella salad, made with whole wheat pita bread, chicken and lots of veggies. Place pita halves in single layer on baking sheet. Bake 4 to 5 min. on each side or until crisp and lightly browned on both sides. Cool. Combine next 6 ingredients in large bowl. Crumble pitas over salad. Mix dressing and lemon juice. Add to salad; toss to coat. This flavorful salad is a perfect way to use leftover cooked chicken. Prepare as directed, omitting the chicken.